OK, so everyone and their Grandmother have asked me for this again this year, so I’ll post my turkey recipe from last year. This is an amazing technique because it a) gives you great flavor & crispy skin, while b) keeps the turkey very moist even with 1.5 hours cook time! Place sliced celery, carrot, onion, fresh thyme and 2-3 bay leaf at the bottom of a sheet pan, then place a metal baking rack on top of that. 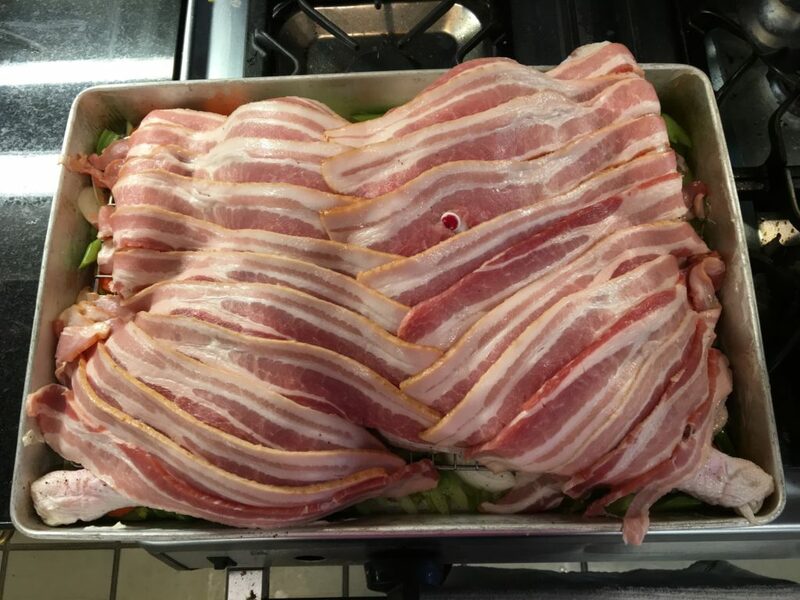 Spread out your spatchcocked turkey on the metal rack and cover it with 2 lb of thick-cut bacon (see picture). Bake it for 1 hour at 450, then take off the bacon and go another 30 minutes (you can reduce the oven temp to 425 if you’re worried about burning the skin). Let it rest, tented with foil, 15-30 minutes after cooking (make your gravy with the drippings while resting), then process the meat and serve. Don’t add salt to the gravy (or the turkey) before tasting it first – the bacon drippings will add enough of it. Post-Soviet Russia is not the democratic heaven some have expected. It was an oligarchy from the day Communism ruled, which meant you had an “Inner Party” of the privileged few, and the VERY poor, under-educated majority. Fast forward to 2014 – Russia is still much the same kind of place – ultra-wealthy few (and the mafia) control the government, while most Russians are barely able to get ahead. The components of the Soviet Union have gone their separate ways – or at least some of them have. One fledgling democracy, if you want to call it that, is the Ukraine. Their democratically-elected President has been unduly influenced by Russia’s Putin to NOT join the European Union, which all Ukrainians have called for. The result is nothing short of violent revolution, with dozens of citizens dead and hundreds wounded by a police force trying to quell dissent. Watch this video, and spread it around. According to the proponents of the Affordable Care Act, individuals and small businesses can now shop for insurance plans across state lines. But can we compare the actual premium costs across all these “ObamaCare” offerings? Yes. Most Americans understand that the US Healthcare system is starting to strain under the load of the “Baby Boomers,” now entering retirement and a huge potential cost to Medicare. But there’s a second wave of healthcare costs that we are only starting to understand, and it will occur right after this first wave, and last far longer: obesity. Today, 69% of US adults are overweight (1 in 3 are obese), and children are far worse off – their obesity rates have tripled in a single generation. First Lady Michelle Obama’s “Let’s Move” campaign directly addresses childhood obesity, New York Mayor Bloomberg is outlawing huge sizes of soda, Kaiser Permanente is changing focus to wellness and prevention, and our current expenditures to treat obesity are $150 billion / year. So it’s serious, but we’re handing it, right? We are actually in for much worse. The percentage of American obese projected in 2030 is astounding. Try to imagine if the $150 billion per year (10% of all healthcare) doubled. Add to that the reduction in productivity in the US workforce as obesity takes its awful toll. Why am I mentioning all this? 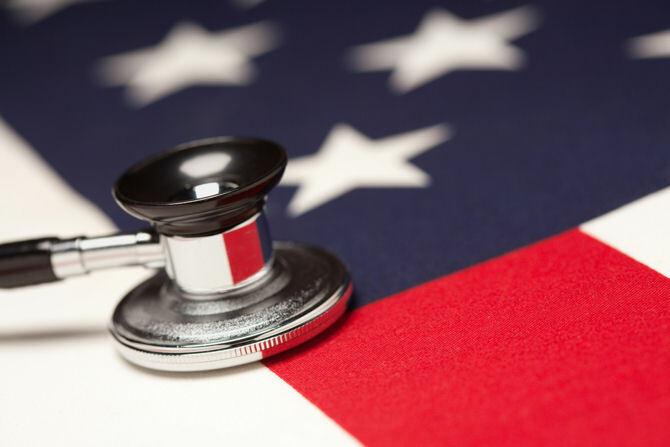 Healthcare reform can’t just be about new ways to pay for it all. We don’t have that kind of money, even if Congress just wants to print more. It’s time that the Federal Government gets serious about cutting costs, especially here – this growing threat plus already existing trillion-dollar annual deficits will make 2008 look like a picnic. Preventative care, nutrition education, physical fitness in schools, and yes, a public health infrastructure separate from the private tier that offers inexpensive medical care to the uninsured, those on Medicaid, undocumented aliens, etc. This is a hard pill to swallow, I know – if we don’t do something now, our economy will collapse under the weight. Years ago, the late astronomer Carl Sagan remarked on a picture taken from one of our deep space probes in the neighborhood of Saturn, in which a small blue dot could be seen. That was Earth. From this distant vantage point, the Earth might not seem of any particular interest. But for us, it’s different. Consider again that dot. That’s here. That’s home. That’s us. On it everyone you love, everyone you know, everyone you ever heard of, every human being who ever was, lived out their lives. Don’t forget that 1 pound of fat is 3,500 calories – so that’s quite a bit of gum chewing. Combine the wine, orange juice, and mustard and stir. Remove the ham from its packaging and rinse. Stand the ham on its end, and run criss-cross lines in the fat side of the ham with a knife (just score it, don’t cut too deep). Insert cloves into the intersections of the criss-crosses. Place the ham at the bottom of the cooking bag and pour the liquid over the ham, then close it up with a tie (don’t poke holes, and push all the air out). 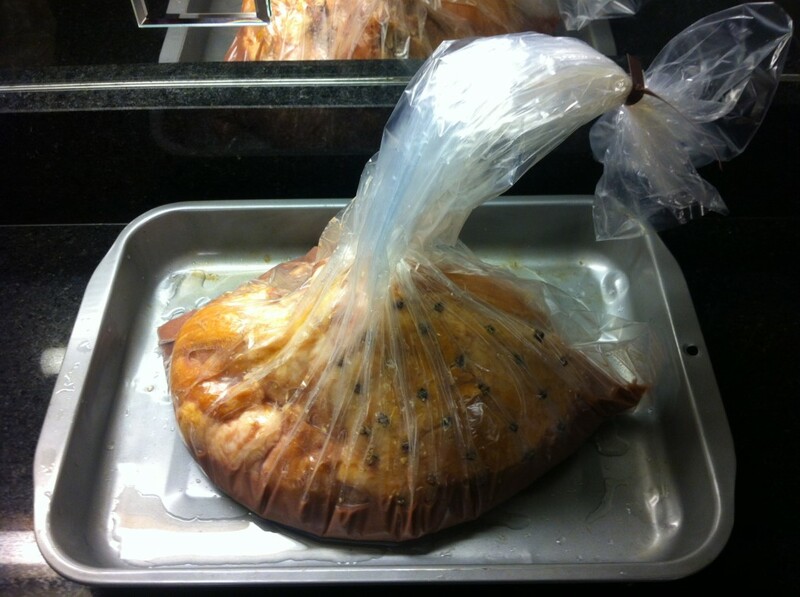 Place the ham on the lower rack of your oven and leave plenty of room for the bag to expand. 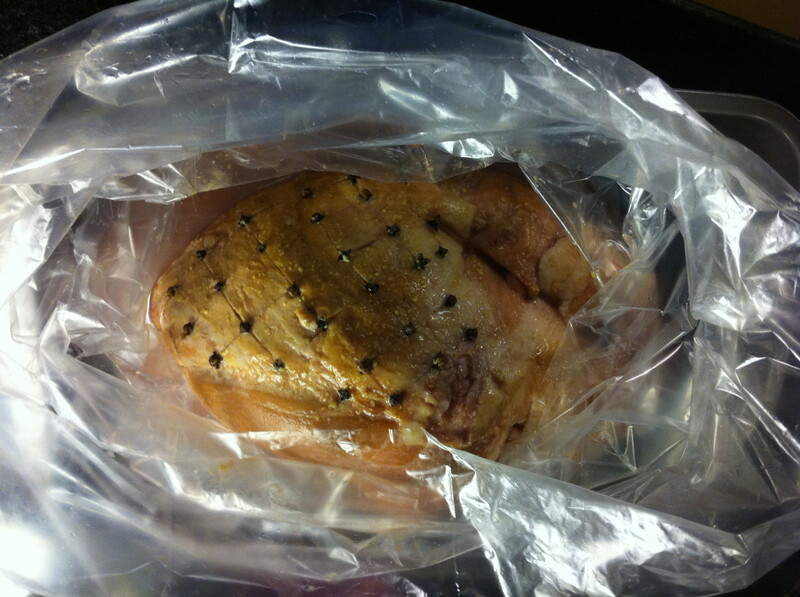 Bake at 275 degrees for 3 1/2 – 4 hours, occasionally shaking the top of the bag to splash liquid on the ham as it cooks. Remove and let stand 15-20 minutes before serving, and be mindful of the cloves. Try this, you won’t regret it! But how do you begin to thank someone whose first gift to you was your very existence? Where do you start – how could you even finish doing that? I remember the old joke about someone famous standing up at an awards ceremony and saying, “I’d like to thank my mother and father for making me possible.” But it’s so much more than that, isn’t it? Every decision where that person gives up part of their life in order to enrich yours – that’s a gift from them to you. Every time they drive you to practice, every dime saved for education, every meal cooked, every time they hold you back in the car seat while braking suddenly – everything they do during your life can be thought of as a gift without wrapping paper. A present without a card. Like a birthday every day. And this extends to each and every one of you sitting here today. It was once written that the value of a person’s life is directly related to the number of people they positively affect. I can’t begin to tell you how many calls and notes I’ve received in the last week from people my father knew for most of their lives. Many are here today, and I’m sure he is very glad about that. As for me, I can tell you that I am, in no small part, a product of my father’s example. He taught me to be self-sufficient, strong, compassionate, and giving. Everyone makes mistakes, and he was no exception, but his mistakes helped me to avoid those pitfalls in my own life. I love you too, Dad. I always have. I always will. You know, Life is a beautiful cycle – as he was leaving, I’m sure a couple of new babies were arriving not too far away. And along the same lines, I have great news that you all should remember. Regardless of your beliefs in the afterlife, this much I can assure you: my Father remains alive and well. He is all around me, in all of you, every day. So honor him today as I am, and write a letter to your kids today, please. They will treasure it more than gold. Thanks. 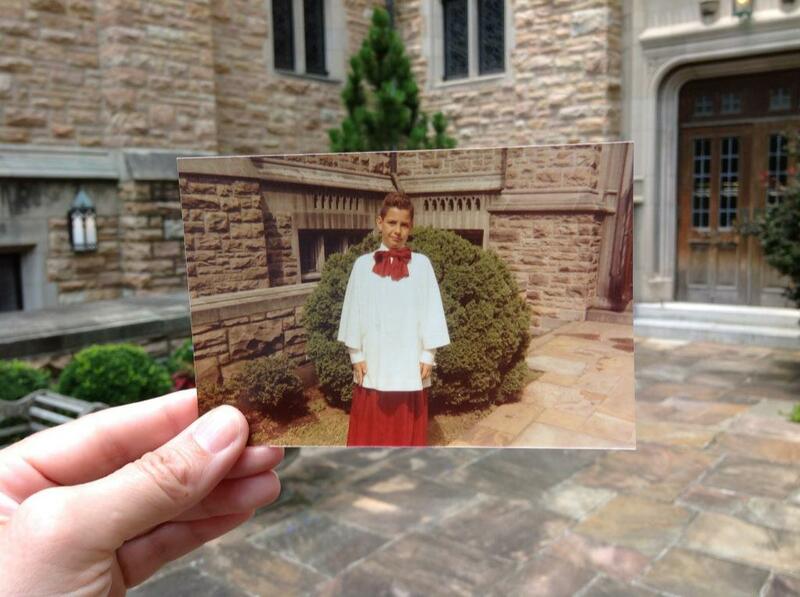 Here’s a “Dear Photograph” styled photo of him as a Choir Boy at West End Methodist, age 12, taken at the exact spot where the original picture was shot. A personal note: Many folks who know me understand my personal code of ethics, which I’ve been living by since I was a kid. A few people know what I’ve been going through recently, and have seen my ability to overcome challenges tested. Some people hit this site with some sense of casual fascination – who is this person, what’s he like? Let me be absolutely clear: I know what I have and have not done in my life (because I was there when it happened). There is no person, no group, nobody who can say with certainly that they know what kind of person I am better than me. And I can say without hesitation that I have stuck to my strict code of ethics my entire adult life. Not only that, but I have committed myself to “doing the right thing” far more than most people. Anyone can judge others – we do it every day. We look at a poorly dressed person in Wal-Mart and instantly think we know they they are about. We see news stories and think we know the truth about the facts – it’s on the news, so it must be correct, right? Wrong. Not everything you see, or read, or hear is even remotely correct. Just because someone is in a position to blare something from the rooftops, doesn’t mean they are any better at drawing conclusions, predicting the future, or explaining reality any better than you. Actions speak far louder than words. Example: deciding “I’m going to devote months of my life to raise money for people who don’t even know who I am” is a far braver act than offering up an opinion or judgment about somebody. That’s transitory – just vapor. What’s real is the results of your actions – who truly benefits from what you do? You or others? 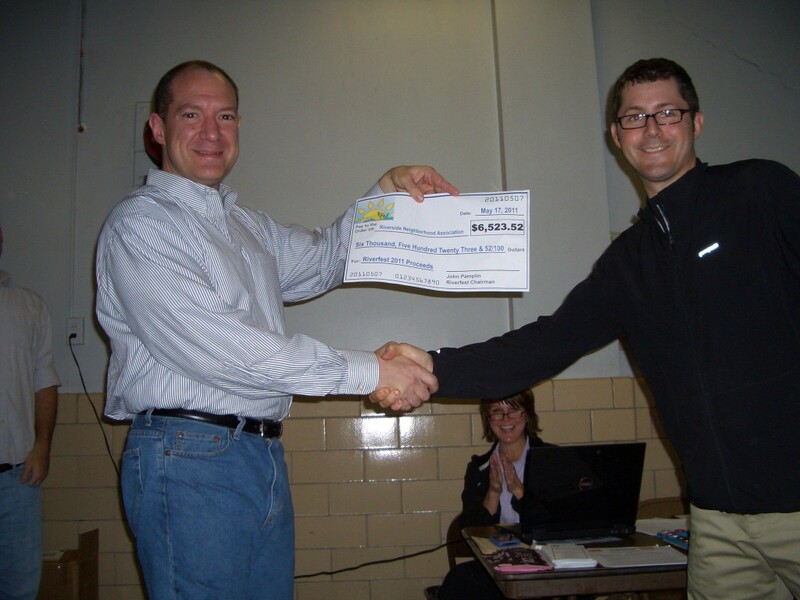 The picture above is the “check presentation” from one of the years I led the Riverfest Music Festival, a small charity fundraiser I founded to raise money for Atlanta charities. This was not a trivial task – it required teams of volunteers, and was pulled off annually to raise tens of thousands of dollars for people who we would never meet or know. But it was needed, and someone had to do it, and I decided one day that it would be me. So what am I trying to convey in this article? It’s not easy being generous or ethical. What’s harder is enduring life’s challenges (whether you deserve them or not), and staying just as selfless as before. An old saying goes something like “suffering builds character” – but some of us have built enough of it, thanks. Before you go off knowing everything about a person, just know that you don’t, and should keep an open mind about others. The world would be far nicer if we all did.